#NTR #Vidyonnathi Scheme, NTR Vidyonnathi for #Civils Guidance for ST Students, Civils Free coaching, free coaching admissions, Vidyonnathi free coaching seats. 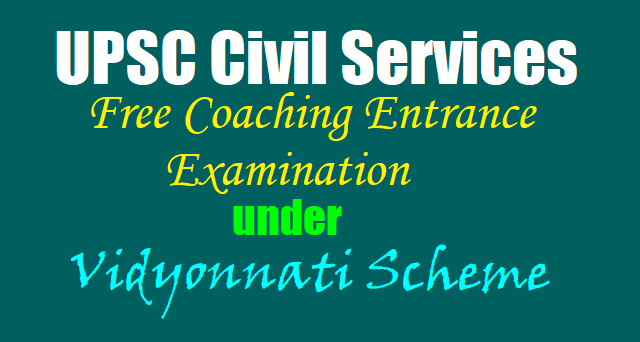 NTR Vidyonnathi for providing Professional Guidance for Civil Services Exams for ST Students: G.O.Ms.No.113-Dated:30-11-2016- Govt of AP, Tribal Welfare Department - Tribal Sub Plan - New Scheme - “ NTR Vidyonnathi” for providing Professional Guidance for Civil Services Examinations for Scheduled Tribe Students in the State of Andhra Pradesh - Enhancement of seats in the intake of ST students from existing (150) to (300) from the year 2016-17 - Sanctioned - Orders - Issued. 1.GO. Ms. No. 10, Tribal Welfare (Edn) Department dated: 03.02.2015. 2.GO. Ms. No. 28, Tribal Welfare (EDN) Dept, dt: 02.03.2016. ORDER: In the reference 1st read above, in order to ensure Scheduled Tribe students reach the Higher echelons of administration and to facilitate their entry in Civil Services, Government has introduced new scheme “NTR Vidyonnathi” for providing professional guidance for Civil Services examination for ST students by conducting 3 guidance programmes subject to meeting the expenditure from the TSP. 2. In the reference 2nd read above, Government have enhanced the seats of ST students under NTR Vidyonnathi Scheme from existing (100) to (150) subject to ratification of State Council for development for SCs & ST.
3. In the reference 3rd read above, the Director of Tribal Welfare, A.P., Vijayawada has requested the Government to issue necessary orders, enhancing the seats under NTR Vidyonnathi Scheme from existing (150) to (300) from the year 2016-17 on par with Social Welfare Department. The Director of Tribal Welfare, Andhra Pradesh, Vijayawada is requested to take necessary action accordingly. 1. Act No. 1 of 2013, dated 24.1.2013. 2. G.O. Ms.No.7, Planning (XXII) Department, dated, 23.2.2013. 3. G.O. Ms No.10, TW (End.1) Department, dated, 03.02.2015. 4. Minutes of 12th Meeting of Nodal Agency for TSP, Dt.23-09-2015. 5. From the Director of Tribal Welfare, AP, Hyderabad Lr.No.J2/3577/2015, Dt:26-10-2015. ORDER: In order to ensure Scheduled Tribe students reach the Higher echelon of administration and to facilitate their entry in Civil Services, Government in the reference 3rd read above has introduced new scheme “NTR Vidyonnathi” for providing professional guidance for Civil Services examination for ST students by conducting 3 guidance programmes subject to meeting the expenditure from the TSP. 2. In the 12th meeting of the Nodal Agency for the Tribal Sub Plan held on23-09-2015, the status of implementation of “NTR Vidyonnathi” was reviewed by the Nodal Agency in detail and keeping in view the response received from ST students and their score in entrance exam, the Nodal Agency vide Resolution No.44/2015 has agreed for increasing the intake from existing (100) to (150) for ST students for the year 2015-16 and recommended to place it before the State Council for ratification. 3. Therefore the DTW, Hyderabad in the letter 5th read above, has requested to issue necessary orders, enhancing the seats under NTR Vidyonnathi Scheme from existing (100) to (150) as no additional budget is required on this for the current year. 4. Government after careful examination of the matter, hereby enhance the seats of ST Students under NTR Vidyonnathi Scheme from existing (100) to (150) subject to ratification of State Council for development for SCs & STs. 6. The Director of Tribal Welfare, Andhra Pradesh, Hyderabad is requested to take necessary action accordingly.